1. Find the video you'd like to download. 2. Below the video's play bar in the lower left hand corner, you'll see a 'Download' button. 3. Click the 'Download' button to indicate that you'd like to download the video. 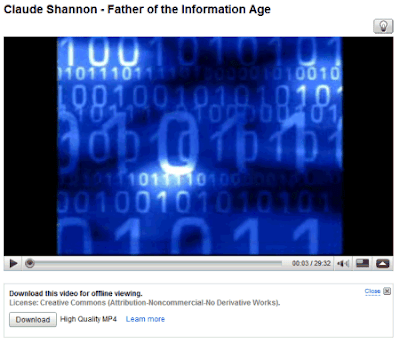 Videos are available to download in the MP4 format and some of them can be downloaded for free and they're even licensed as Public Domain or Creative Commons. An example of channel that offers Creative Commons-licensed video downloads is Stanford University. If the download requires payment, you'll be directed to a Google Checkout page where you'll find the price of the video. Google Video had a similar option that has been discontinued in 2007, but it used DRM and it required to be online in order to authenticate your credentials. Is there anything for sale yet? Google being Amazon now ?? i think you can dload youtube videos just by putting 'pwn' as the first part (subdomain) of the url. Google needs to allow all content providers to pick a price and options for downloads. Also let content providers pick prices for ad-free streaming. For example HD streaming might cost a few cents while only the lo quality might be free and ad-supported. Also, I'd like the HD version be somehow automatically launched as streaming in VLC rather than using the embedded Flash player. On my computer, Youtube HD works better in VLC, as the embedded flash player in the browser, Youtube HD is not playing back as smoothly as in VLC. Simply put, Youtube needs some type of .pls type of file format which should be easily setup to launch the HD quality stream instantly in VLC or some other media player software. I wouldn't mind if Youtube even provided a special version of VLC (like the Google Video Player) which might have this support built-in. Why pay for the video when you can download it with many extensions and free and paid programs? I use a paid program to download standard, hi-def and HD clips. Free Download Manager works great with IE to download and convert YouTube clips (.flv to different formats). Try http://startube.mobi its 100% FREE to DOWNLOAD Youtube Videos. NO SOFTWARE NEEDED. just click the Video Link, You can Download in Many FOrmats like 3Gp for MobilePhone, Mp4 for iPhone and iPod and FLV for pc. but it is free why pay??? I use youtubeclipextractor to download videos/music from Youtube and convert to any format needed. You can get it at www.youtubeclipextractor.com It's easy to use and works great. ํYes, i agree with you. if you want to play game online casino please click this post.thank you. Just replace the https://www.youtube.com with http://www.youtubev2.com or http://www.playcloud.in to download youtube videos. No need to install any app.